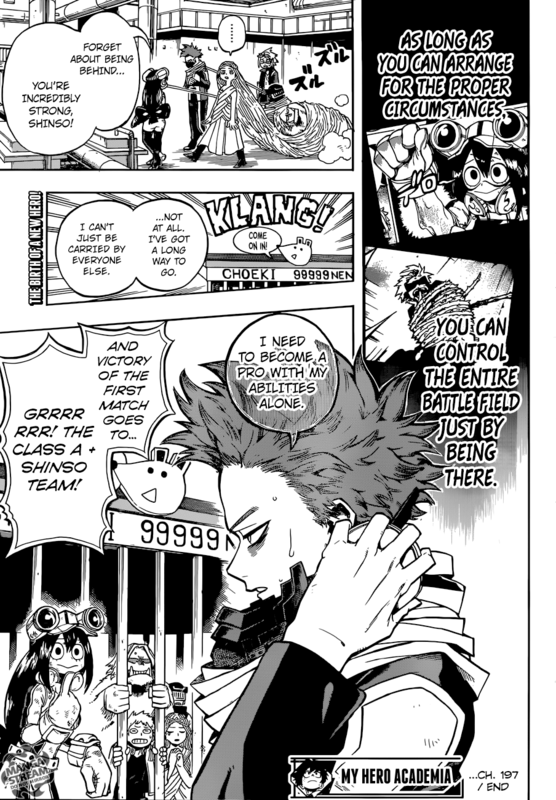 Class 1-B watches as Hitoshi, Tsuyu and Denki disguised themselves as Tsuyu by using her mucus on Hitoshi and Denki to hide them from Jurota’s sense of smell. I find this to be gross but still cleaver and effective. Jurota is their main target as he’s considered the largest threat. 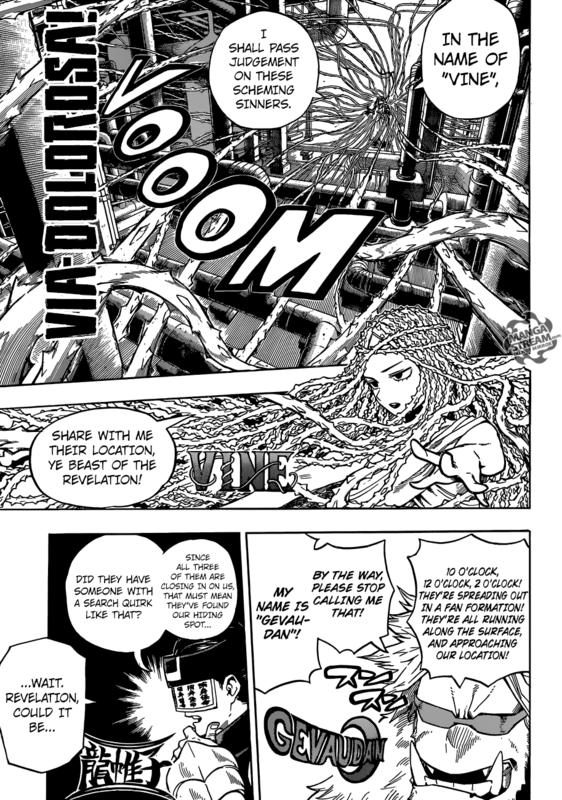 Ibara uses her vines to capture Denki and encases him in them to protect her teammates from his power. Using his “pointer” he uses his discharge in a straight line to attack. Denki isn’t considered to be the most intelligent but his ability to use electric has potential. So far his use of his quirk is severally limited by it’s side effect. 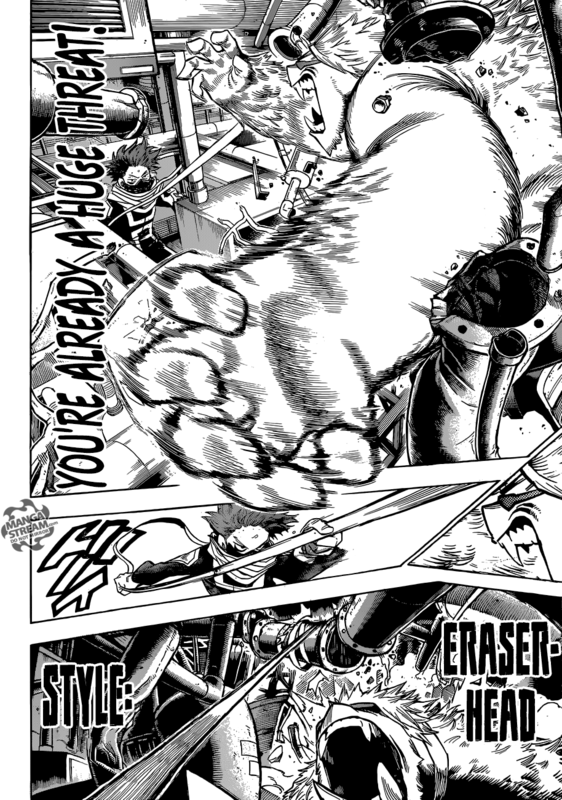 Denki’s attack is deflected by Hiryu, who uses his scales to knock of the pointer. His quirk “allows Hiryu to form hard scales through his entire body, which he either use as protective armor or fire off as projectiles.” Ibara hears Hiryu say that she should “send out some more vines,” and responds. It turns out that it was Hitoshi, resulting in her being brainwashed. 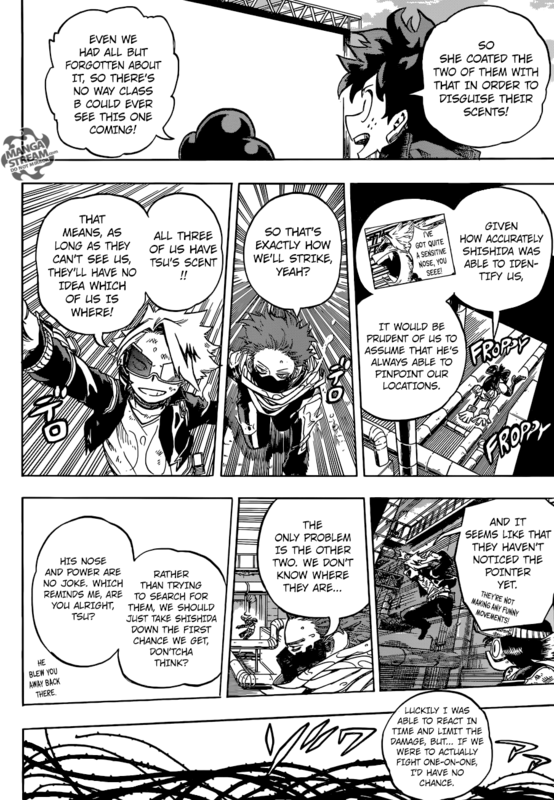 Remembering his plan he and Denki planned for him to get caught. Ibara is limited to the amount of vines she can use, meaning by stopping Denki she has limited herself. Hiryu quickly tries to wake up Ibara, but Tsuyu grabs her with her tongue. Hiryu tells Jurota to find Tsuyu because she is the biggest threat. Tsuyu quickly lands a devastating flying kick on Hiryu. Jurota locates Hitoshi and attacks him. Hitoshi using Eraser head Style: Binding Cloth manipulation to pull a pipe onto the head of Jurota. Hiryu flies at Hitoshi, telling Jurota to duck. He however, refuses to do so believing that it’s Hitoshi trying to trick him again. He and Jurota collide, knocking each other out. The team of Hitoshi, Tsuyu and Denki win. I found the quirks of Tsuyu and Jurota to be the most interesting of the ones displayed. The quirks that emulated “animals,” seem to have the most variety and therefore the most versatile. I’m excited to see other members of Class B.